Get a total of over 160 Red Raspberry Jolly Ranchers and only the Red Raspberry ones. These little Red Raspberry Jolly Ranchers taste AMAZING! But they are extremely hard to find! But you found them! They are all individually sorted and so you only get the ones that you really want, the Red Raspberry Jolly Ranchers! 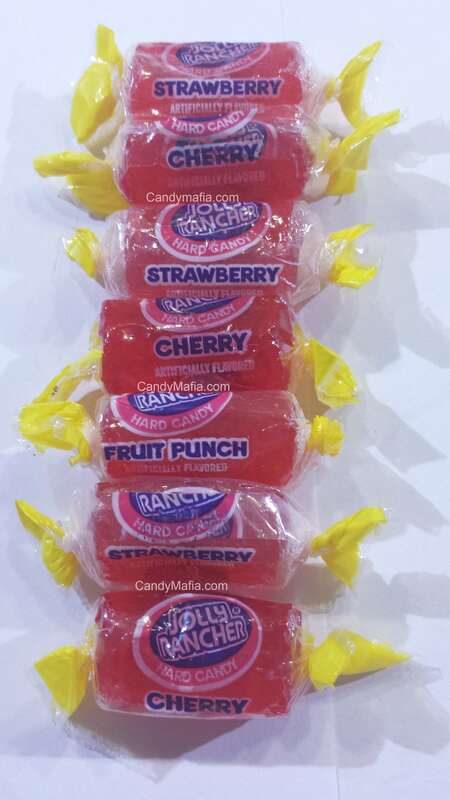 The reason that the Red Raspberry Jolly Ranchers are more expensive than the other flavors is that they are only released in limited quantities, and they use the identical dye as the other flavors. It makes sorting them out extremely difficult. Often times, they are packaged with the Cherry and the Fruit Punch flavor and they all look identical! But at least you don't have to buy an entire package and throw out the other flavors that you don't like. Thaks again for loving Red Raspberry Jolly Ranchers! See why it's so difficult? These are my absolute favorite. Even though they are sticky coming out of the wrapper, I love them. Candy Mafia let me know that this is an issue with this flavor and compensated with blue raspberry. I'm just thrilled with getting the red raspberry!! Shipping was awesome!! Opps, I wrote my last review for the Raspberry Jolly Ranchers, when it should have been for the Blue Raspberry Jolly Ranchers, but what I said about the Raspberry ones is exactly what I would right for the Blue Raspberry except they do not stick to the wrapper like the Raspberry ones do. Great company, great candy, great prices and great choices in the amount you order. Will continue to order from Cany Mania in the future. This is my fourth order from Candy Mafia and I have zero complaints. My product always arrives on time and in perfect condition. I was pretty upset when red raspberry jolly ranchers went off the market as it is my favorite flavor. I was very happy when I discovered that Candy Mafia sold a huge bag of just that variety on its own and I have not been disappointed! Super product and an awesome company. I always order from Candy Mafia for the quality, consistency, and ease. Red and blue raspberry are often hard to find, so it's such a convenience to order them here. They always arrive in good condition and quickly. The communication with the seller is an additional bonus. Great company! Click the button below to add the Raspberry Jolly Ranchers 160 pieces to your wish list.